HAKI has recently taken an important step towards providing customers with a more service-focused offering, by investing in various digital tools to facilitate customer requirements. This includes the new HAKI Design Tool and HAKI BIM, which have been developed together with Cadcraft. 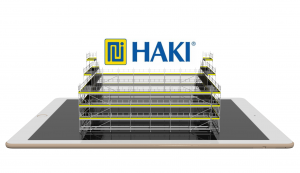 The HAKI Design Tool is a 3D-based product configurator that allows you to configure your scaffolding designs directly through the web; offering a great deal in time saving and reduced risk of incorrect input by non-CAD users. The solution is based on Inventor iLogic and Configurator 360, from Autodesk, and brings an improved visualization to designs at a more professional level. To enable a more advanced drawing mode for system settings, we have also created HAKI BIM, which allows technical support to complete your configuration. Data is picked up digitally from the configurator and is loaded into Autodesk’s Revit for customization. In the application, the access solution can be quantified, and the data can be exported for production. Also, when required, the BIM system can calculate the strength of the designed solution using Robot Structural Analysis. Due to the intelligent management and model development of our tools, together we can now deliver complete project documentation in a shorter lead-time. For a demo of or access to our HAKI tools, contact your local team now.